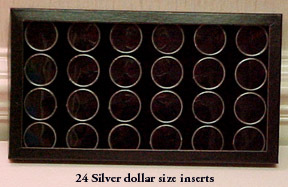 24 Button Trays. (8" x 14.5" x 1" Sgt. Riker Case.) 24 plastic, lidded inserts (1 5/8" diam.) to hold coins, buttons or small collectibles. Perfect for silver dollars). Please specify white or black foam insert. (8" x 14.5" x 1" Sgt. Riker Case.) 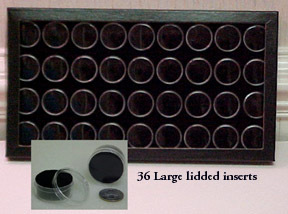 36 plastic, lidded inserts (1 3/8" diam.) to hold coins, buttons or small collectibles. Please specify white or black foam insert. 50 Button Trays. (8" x 14.5" x 1" Sgt. Riker Case.) 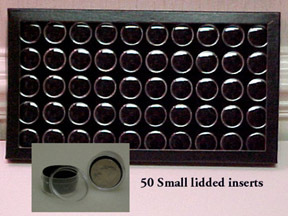 50 plastic, lidded inserts (1" diam.) to hold coins, buttons or small collectibles. Perfect for the state quarters! Please specify white or black foam insert.